The toll from twin bombings targeting Shiite pilgrims at a religious site in the center of the Syrian capital Damascus has risen to 74 dead, a monitor said on Sunday. The dead included 54 civilians and 20 security personnel, the Syrian Observatory for Human Rights said. The Britain-based monitor said that 11 bystanders and eight children were among those killed. Among the victims of Saturday's blasts were 43 Iraqi pilgrims who had come to Damascus to visit Shiite shrines in Damascus's famed Old City. Saturday's attack close to the Bab al-Saghir cemetery in central Damascus, frequented by Shiite Muslims, was caused by a roadside bomb followed by a suicide bomber who blew himself up in a crowd of visitors, according to the Observatory. The attack has left dozens of people injured and some of them are still in critical condition, the watchdog said. Iraq said that the attack had killed 40 of its nationals and injured 120 others who were visiting. Syria's state news agency SANA said 40 people were killed and around 120 injured in the attack that it said was caused by two explosive devices. There has not been yet a claim of responsibility. In a statement released on Sunday, Turkish Foreign Ministry condemned the attack. 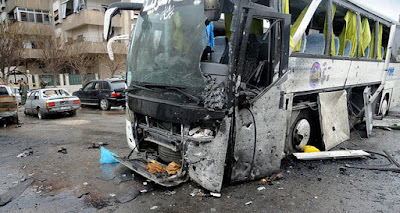 "We strongly condemn the bomb attack perpetrated yesterday (11 March) in Syria's capital Damascus, which targeted the visitors of the Shiite holy places and resulted in the death and injury of many people. We wish Allah's mercy upon those who lost their lives, and speedy recovery to the wounded," the statement said. Shiite shrines are a frequent target for extremists groups of Al-Qaeda and the Daesh, not only in Syria but also in neighboring Iraq. Damascus has seen several attacks since the Syrian conflict started in March 2011. In November last year, 20 people were killed in two suicide attacks in the mainly Shiite suburb of Sayeda Zeinab in southern Damascus. The radical Daesh terrorist group claimed that attack. Twin suicide bombings in the high-security Kafr Sousa district of the capital in January killed 10 people, eight of them soldiers.